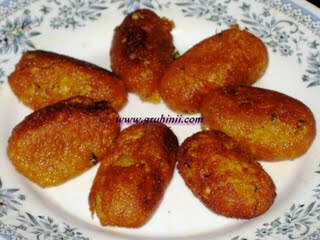 Heat oil in a pan and deep fry the koftas until golden brown. Remove from the oil. Drain on a kitchen paper and keep them aside. Heat 2 table spoons of oil in a pan. Add shahi jeera, cinnamon and cloves. 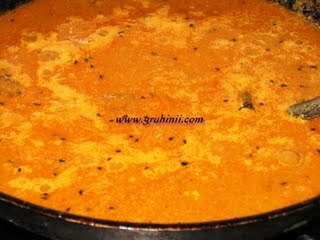 When shahi jeera starts spluttering add 2 tea spoons ginger garlic paste. Fry for few mins and add the onion paste. Fry until the onion paste turns to pink. Add red chilli powder and haldi, stir and add the tomato paste. Mix well add salt and cook in a medium flame until the paste is cooked and starts leaving oil in the edges. Now add cashew/khas khas paste and a tea spoon of sugar (optional). Cook for few more mins. and add 2 to 3 cups of water. Boil until the gravy thickens. Switch of the flame and take the gravy into a serving bowl. 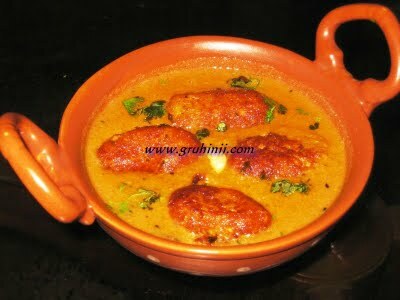 Add the koftas to the gravy garnish with chopped coriander leaves and serve immediately. Tip: You can prepare the koftas in advance. Keep the gravy separately. Add koftas only when you serve.